Stanley Donwood has decorated a ‘cow’ – (a pretend one!) for auction. The artwork on the cow ‘Restructured Burger’ is a reflection of the artwork featured on the current Radiohead album, ‘HAIL TO THE THIEF’ – see picture attached. Please go and have a look at the website www.cowparade.net for all information about the cows and their artists and click on the ‘Ireland’ link to find specific information on Stanley’s ‘Restructured Burger’. Also attached is notes on how to paint the cow from Stanley (see below). The auction is on 20th November in the Four Seasons in Dublin. Catalogues cost EUR25 and tickets to the auction will be EUR150. Proceeds go to The Dublin Simon Community (for homeless people) and The Jack & Jill Children’s Foundation. Click “continue reading…” to read Stanley’s instructions on how to paint the cow. How To Paint Your Cow. Paintbrushes. You will need a fat brush and a thin brush. Paint lines on the cow to divide it into slaughterhouse sections. 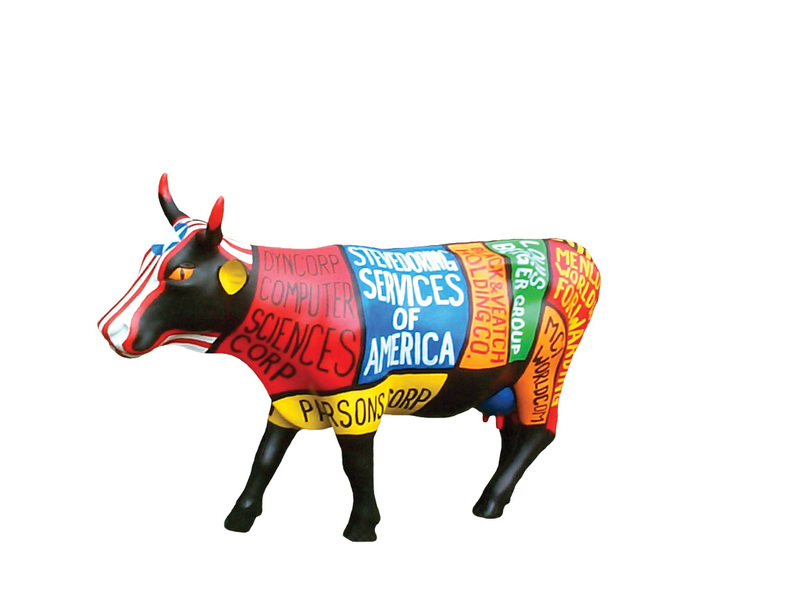 There will be nine sections on each side of the cow. Paint each section a different colour. Try not to use the same colour for adjacent sections. Paint the names of the 18 companies who have been invited to restructure Iraq on the sections. Paint the Stars & Stripes on the cow’s head. Paint blood on the horns. This part is fun! Paint a country the shape of Britain on the back end of the cow’s udder. Congratulations! You’ve painted your cow! Hooves. Are you going to bother? No. Just do them black. Like the legs. Are you going to try to paint a company name under the belly? Come on, this is supposed to be fun. Can you remember what shape Britain is? A witch riding a broomstick, I once heard. Heading west. Cows are big. They have a lot of surface area. Don’t go thinking you can paint your cow in a couple of hours. I’d plan on allowing at least four days. Don’t try to explain what you’re doing to a stranger at the local pub. He will not understand. Next post: Fire at West Palm Beach Show?